FIU is ready to remake itself. That was the message from FIU President Mark B. Rosenberg in a recent town hall discussion focused on developing the next strategic plan. While the university has excelled under the guidance of the current plan, known as “World’s Ahead,” national and global shifts will dictate what’s ahead for FIU. “There are many new paradigms that we’re going to have to think about,” Rosenberg said of the challenges facing universities across the country. 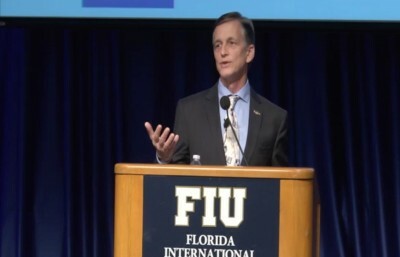 He cited decreased taxpayer funding of public higher education, global economic concerns and, in Florida, the new scorecard by which state universities are measured. The 10-member commission, appointed by Rosenberg, has been meeting since this past fall to evaluate challenges and opportunities currently facing FIU. The commission’s charge is to produce a white paper with key recommendations that should influence the strategic plan that will guide FIU through 2020. Foremost among the changes discussed: the digital technology that allows students anywhere to attend the institution of their choice. “No longer can we think about a university as a place that everyone is going to come to,” Furton said. Technology will make it possible for FIU to serve greater numbers of students around the world through online courses and degree programs. But, he added, it also increases global competition as more universities embrace a digital future. Also impacting FIU: a growing need to partner with local and global industry to both create opportunities for students and to stimulate private funding in an era of dwindling public support. The greater effort to place graduates in jobs acknowledges the continuing tough economy. It also speaks directly to the state of Florida’s new system for rewarding those universities that show the strongest link between graduation and employment. That funding equation—particularly as the state legislature considers a moratorium on tuition hikes—looms large as Florida’s universities are being asked to do more with less. To meet the expectations of the State University System of Florida and the needs of students, faculty and the community, the university commission made nine recommendations that will be considered for inclusion in the 2015-2020 strategic plan. These range from improving FIU’s six-year graduation rate and increasing enrollment to 65,000 students, to pursing a more prestigious research designation and completing a $750 million capital campaign. Among the attendees who spoke up during the question-and-answer session was Vicenta Shepard, a faculty administrator in the Center for Academic Success. She had questions about the university’s dual enrollment program, which gives high school students college credit for certain courses, oversight for which rests with FIU professors. Anyone else who would like to make comments or a suggestion can do so through March 18. To see a webcast of the town hall meeting in its entirety, click here.